I have another discovery for you -- Keto Cinnamon Toast Crunch. I admit, cereal is one of the things I miss quite a bit. 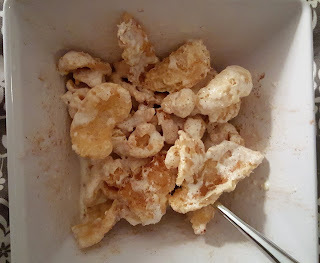 The crunch of cereal in milk is something I just couldn't imagine being able to re-create on keto. Until today. I whipped this up in a couple of minutes and while not exactly the same as Cinnamon Toast Crunch, it satisfies the craving. Now the pork rinds -- I know they aren't for everyone and even weirder as a cereal. I was a bit on the fence myself but went for it and wasn't grossed out. It's amazing the things I'll try now that I've been on a bread-pasta free diet for 8 months! Directions: In a cereal bowl combine first thing ingredients mixing well to cover the pork rinds in dust. Add cream and mix together. Eat quickly so pork rinds don't turn mushy.